Then I remembered that TxDOT put their right of way maps online, so I decided to look for clues there. The map shows that, as I suspected, the old pavement to the west, near the westbound-to-eastbound turnaroud is the US 80 right of way. It also shows that the scarring on the ground toward the southeast across the interchange was US 290. 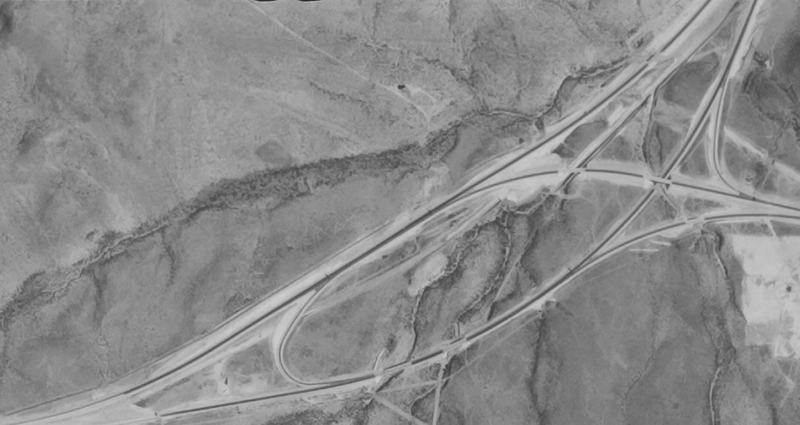 As can be seen on the map, the new I-20 ramp somewhat follows the old US 80 right of way, and the old junction shown in the photo is just about where that scarring meets the modern road. It looks like it was a little to the north of there, where the ground would have been reshaped to build the new road. Conveniently marking the spot, it's right where the road narrows to one lane. The map even shows the details of the buildings. It shows the service station at the junction, with the water tank tower behind it. It also shows a motel to the east of it, which can't been seen in the photo, and may not have been there at the time. There were other buildings nearby, including dwellings, presumably for the staff. That would make for an easy commute. The ROW map is at https://maps.dot.state.tx.us/ROW_PDF/ODA044109AA.pdf The page to get maps is https://maps.dot.state.tx.us/AGO_Template/TxDOT_Viewer/ The maps are not available for all highways, and in some TxDOT districts very few are available. Thanks for your research on that. Have I illustrated it correctly on this map? That looks correct to me. 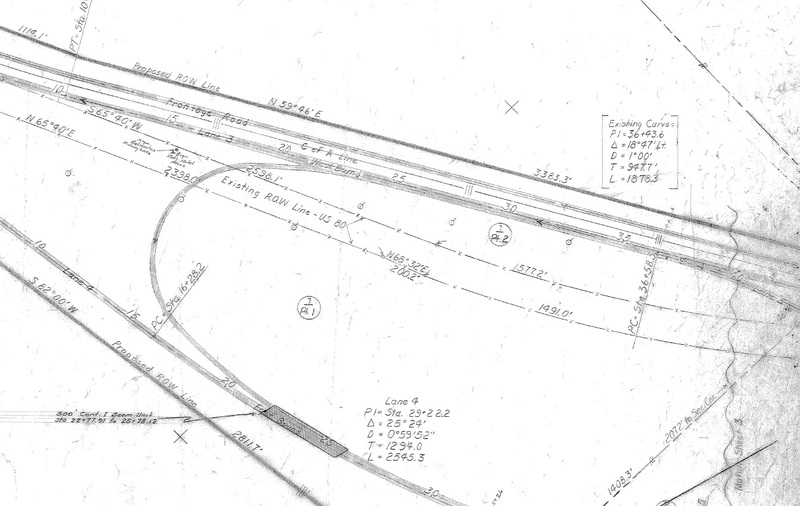 It's evident in the aerial photography, but I like having the documents to verify it. Why are there two U turn ramps from WB 10 to EB 10/20? It looks like a new one was built beside the old one. I wonder that, too. 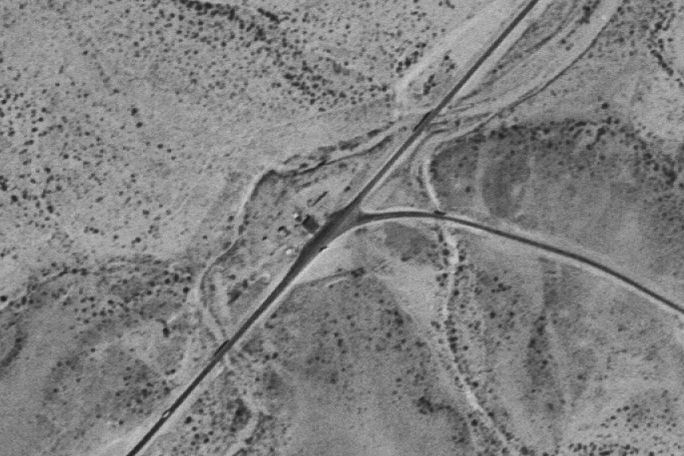 The existing ramp seems to be the one indicated on the map, which is dated 1980, but Google Earth shows the old ramp in 1997 and shows the new one in the next image, from 2003. The new ramp is where the roads are closer together, but the curvature is about evenly spread out. The old ramp is straighter initially and then curves sharply at the end. It seems that would give more time to slow down at first but would require a lower speed at the end. I could speculate that they were reluctant to follow the original plan because of concern that drivers wouldn't slow down enough before the curve started. Perhaps after observation and statistics showed that wasn't a problem, they decided to build the ramp as originally designed, which may support a higher minimum speed. There is a sign showing an advisory speed of 35 with flashing lights to warn of the curve. Here's a nice bit of history. This is the junction in 1953. It shows the roads and buildings. The stream channel northwest of the buildings is in pretty much the same shape now, so you can see where everything was back then. 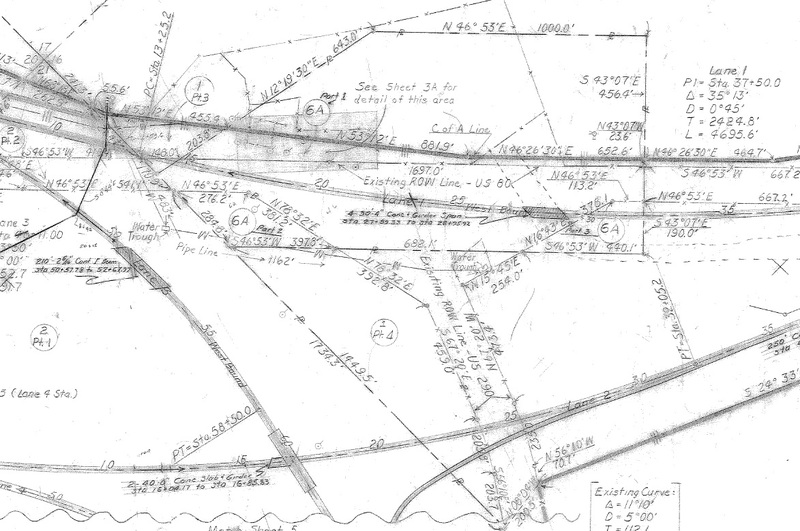 It's interesting to note that Ninemile Draw went under US 80 west of the service station, from south to north, then back to the south on the east side. When the interchange was built, the channel was separated from the northern channel and straightened so it stayed south of of the westbound lanes. That's why the current channel (visible below) is straight and looks like a road alignment (from the curved bridge on the I-10 westbound lanes northeast toward old the US 290 alignment). The survey is labelled 1980, but the roads wer already built by then. This photography from 1969 shows it complete, with the turnaround ramp in its old configuration. Image source is USGS EarthExplorer: https://earthexplorer.usgs.gov/ By signing up for a user account you can download high resolution images.